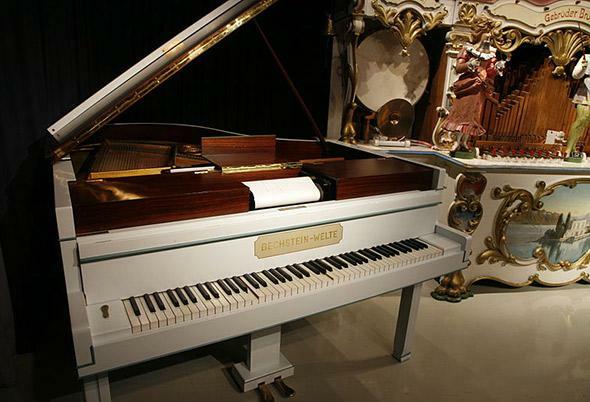 White-Smith Music case: A terrible 1908 Supreme Court decision on player pianos. How a terrible Supreme Court decision about player pianos made the cover song what it is today. The player piano deeply troubled composers at the time of its introduction. Way before Spotify, stereos, or even radio, Americans who wanted to listen to music at home had one choice: They could play it themselves. This changed by the 1890s, when a hot new technology arrived: the player piano. Player pianos were miraculous in their ability to play popular songs and old standards alike while people sang along, danced, or just enjoyed the sounds. But as with a lot of newfangled machines, not everyone loved the player piano. In particular, the technology deeply troubled composers, such as the famed John Philip Sousa. Sousa worried that the pianos would kill the public’s demand for sheet music, and copyright royalties from the sale of sheet music were what paid composers’ bills. To make matters worse, the player piano companies refused to pay royalties for the songs they put on piano rolls—scrolls of paper with holes punched out in patterns. People couldn’t read the rolls; they spoke only to machines. And on that ground, the player piano companies argued that the rolls did not “copy” songs, and so could be manufactured and distributed without the need to pay royalties. This was an exceptionally stupid argument. Sheet music and player piano rolls both copy songs; they just use different languages. What matters is what comes out when the language is translated. And for both, the answer is the same: music. So the issue wasn’t terribly difficult, but apparently it was complicated enough to fool the Supreme Court. In a 1908 case called White-Smith Music Publishing Co. v. Apollo Co., the Supreme Court sided with the player piano companies. The court said that because humans couldn’t read player piano rolls, they were not in fact copies, and as a result, composers like Sousa couldn’t demand any royalties. The conventional wisdom is that no one will innovate if others can copy freely. Why invest the time to invent a better mousetrap, or write a great song, if someone can just take the fruit of your hard work and sell it themselves? This basic logic—that copying is bad for creativity—is the fundamental reason we have patent and copyright law. These rules exist to make sure that copying is only legal when the creator agrees to it. Unauthorized copying—as anyone who has watched a DVD with an FBI warning at the start knows—is against the law. So when, more than a century ago, the Supreme Court declared that copying by player piano companies was just fine, we saw the beginning of a process that culminated in the death of American songwriting. Songwriters stopped writing, fearful that the piano roll companies would just steal their new songs and feed the expanding market for player pianos at home. Thanks to the Supreme Court, the golden age of American song essentially ended in 1908. If something seems wrong about this story, it’s because the last part is completely false. As we all know, the golden age of American songwriting did not end in 1908. In fact, geniuses such as George Gershwin and Cole Porter were still kids when White-Smith Publishing was decided. Nearly all the “great American standards” were written in the decades after White-Smith Publishing. The reason American songwriting not only survived the onslaught of the player piano, but thrived, tells us a lot about how creativity really works. The first important thing to know is that the actual result in White-Smith Publishing lasted but a year before it was overturned by Congress. The Copyright Act of 1909 extended the law to cover all “mechanical” reproductions of songs, whether read by people or machines. At the same time, however, Congress did a very important thing: It mandated that all songs would be subject to what lawyers called a “compulsory license.” This meant that any musician could copy another’s song without asking permission, so long as they paid a low standardized fee to the songwriter ($0.02 per copy, originally, and quite a bit lower, adjusted for inflation, today). So on the one hand, Congress overthrew the argument that player piano rolls were not songs. But on the other, Congress set everyone free to copy, just so long as a small fee was paid. So why did Congress create this unusual system of legal copying? Because it was afraid of one company—Aeolian. That firm is long gone. But in the early part of the 20th century, Congress viewed Aeolian as something like the Microsoft or Google of the nascent player piano market. Anticipating that Congress would overturn White-Smith Publishing, Aeolian swiftly bought up song rights from musicians and publishing companies so it could copy them onto player piano rolls. Aeolian’s weaker competitors complained to Congress about this attempt to corner the music market. An automatic piano roll, Vienna. 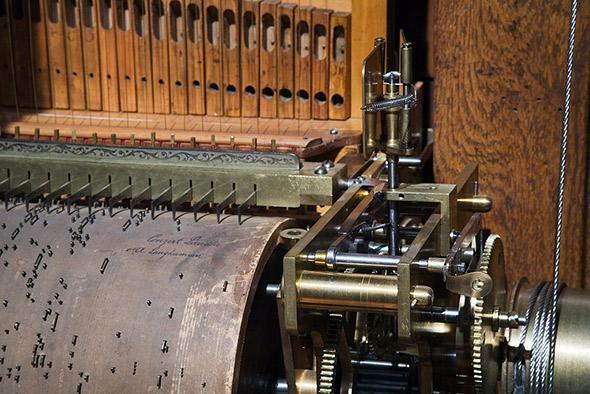 So to keep the Aeolian Co. from having a monopoly on the then-crucial player piano roll market, Congress allowed anyone to make a mechanical reproduction of someone else’s song. And that doesn’t just mean that Aeolian’s competitors could make their own piano rolls of popular tunes. Congress’s compulsory licensing scheme legalized the cover song—anyone can make their own recording of someone else’s song, just so long as a recording of that song has previously been released, and the cover artist pays the required fee. (In practice, most cover artists pay privately negotiated rates that are even lower than the fee set by Congress). And the freedom to cover others’ songs gave birth to a vibrant culture of continuous musical revival, remaking and reinterpretation, all of which allows good songs to become great and, sometimes, we must admit, classics to be butchered. It’s all in the eye (or ear) of the beholder. But the important point is that because of Aeolian’s dominance of a now-defunct technology, we have a musical culture in America in which musicians are free to tweak songs they like—and they do so with great enthusiasm. Bob Dylan wrote “All Along the Watchtower”; Jimi Hendrix turned it into something quite different and, arguably, made a great song even greater. Another 1960s classic, Van Morrison’s “Gloria,” has been covered by performers including Jimi Hendrix, the Doors, David Bowie, Tom Petty, Bruce Springsteen, Rickie Lee Jones, AC/DC, and (in perhaps the song’s most memorable and inventive reinterpretation) Patti Smith. “Gloria” is an enduring song in part because so many legendary musicians have tweaked it. Cat Power, John Lennon, Willie Nelson, Paul Anka, and many other famous artists have issued albums of nothing but cover songs. All this legal copying has made our musical culture immeasurably richer. Has the freedom to copy others’ songs, in exchange for a very low fee that the original songwriter has no power to override, suppressed the incentive to write new songs? There’s no evidence of that. Indeed, the opposite is true. Every day we see a continual outpouring of new songs. And many of the copied songs—the covers—are themselves incredibly creative. Think about jazz greats like Charlie Parker and John Coltrane. On one level, they are copying—Coltrane’s version of the Rodgers and Hammerstein standard “My Favorite Things” relies on that song’s famous melody. But if Coltrane starts there, it’s certainly not where he ends up. By the song’s end, more than 13 minutes later, Coltrane has altered the original melody and taken it in a much darker, more contemplative direction. At some point in the song, Coltrane crosses the uncertain border that separates copyists from creators. Britain dominated the industrial revolution because it had a far larger population of skilled engineers and artisans than its competitors: resourceful and creative men who took the signature inventions of the industrial age and tweaked them—refined and perfected them, and made them work. In creating the cover song, the Congress of a century ago had no idea it would let loose one of the great innovative forces in music. It was just trying to repair a blunder by the Supreme Court and ensure that the giant Aeolian Co. didn’t swallow the entire player piano market. Today, the player piano market is minuscule, and Aeolian has been dead for almost three decades. But the lesson of Aeolian lives on. Copying and creativity are not opposites—they are often complements. Since there is nothing new under the sun, every creator relies, sometimes to a large degree, on what came before. This should be obvious, but too often it isn’t. Copying is viewed as a terrible thing, a crime and a killer of creativity. To be sure, copying can have bad effects. But as the Aeolian story shows, it can also be the key to new forms of creativity we never could have imagined.